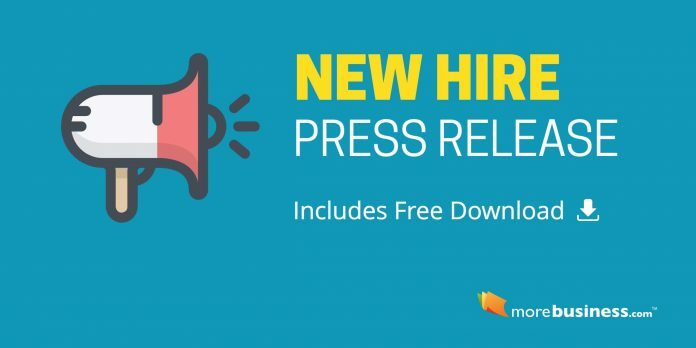 Copy/paste this new hire press release to create a new employee announcement for your organization. Publicizing your senior level staff, for example, can give you more exposure and credibility. Make note of the centered ending characters “###”. These mark the closing of the new hire press release so the reporter will know that there are no further pages. <city, state>-<date>-<your company> hired <employee’s full name> as <job title>. <employee’s last name> will <job function, reason for hiring>. <your company> specializes in <your main type of service> for <your clientele>. <other company info, optional>. For more information, contact <contact’s name> at <contact’s phone number>. Washington, D.C. – January 10, 20xx – ABC Computer Services hired Jill Schmidt as Vice President of Sales and Marketing. Schmidt brings with her nearly fifteen years of experience marketing computer systems and services. She has worked with both government agencies and private industry. Schmidt holds a B.S. in Information Systems from George Washington University and an M.B.A. from the University of Michigan. ABC Computer Services specializes in computer facilities management. For more information, contact John Q. Public at (202) 555-1234. Now that you’ve written your new employee press release, how do you get reporters to publish it? Using a press release distribution service is the easiest way to get the word out. These services keep track of publications and contacts by industry so you can target the general audience you want to reach. We’ve found eReleases to be an affordable service that capitalizes on the distribution capability of major newswires at a significantly reduced cost. They also provide access to free eBooks on writing and using press releases. Using a press release distribution service also archives your announcement on a site that reporters constantly review to find stories. This allows your new hire press release to live practically forever. Additionally, the links that point back to your site will help with your website ranking through search engine optimization. You can also contact the editorial desk of a publication directly. Find out which reporter in a publication that you want to target covers new hire announcements. Then, send them a short note along with your new employee press release. There’s usually no need to follow up with reporters to see if they received your new hire announcement. Reporters don’t like to be bugged about that. When they like what you sent, they will publish it.